The ICV 4030 is a further development of the tried-and-tested, 3D-capable CNC machine CPV 4030, which is delivered ready for connection to the power supply. The sliding hood, which opens upwards, can be conveniently operated from a sitting position. The completely bolted chassis produces higher precision when assembling the machine and makes it easier to service. Moreover, it was possible to optimise the resonance and vibration behaviour and thus achieve lower noise levels. The only prerequisites for working with the ICV 4030 are basic knowledge of CNC systems, general IT literacy and basic knowledge of graphics programs! The choice of the ideal CNC machine for you should focus both on the clamping area for the workpiece, materials or plates to be machined and on the strategy or difficulties of the machining. In principal, all machines are perfectly suited for machining light metals, non-ferrous metals, plastics and wood . 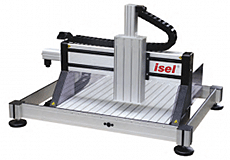 Extensive range of accessories for all our CNC machines to order. The choice of the ideal CNC machine for you should focus both on the clamping area for the workpiece, materials or plates to be machined and on the strategy or difficulties of the machining. In principal, all machines are perfectly suited for machining light metals, non-ferrous metals, plastics and wood. Extensive range of accessories for all our CNC machines to order. 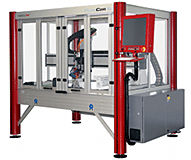 The ICP series CNC machines are a further development of the tried-and-test CPM series. 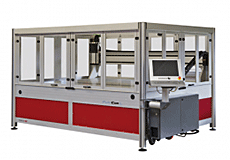 By the introduction of a sliding door, the machines can now be operated in sitting position, which, amongst other things, results in shorter cycle times for opening the cover. The chassis is completely bolted, instead of welded like its predecessor. 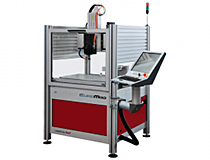 This produces higher precision when assembling the machine and makes it easier to service. Moreover, it was possible to optimize the resonance and vibration behavior and thus achieve lower noise levels.